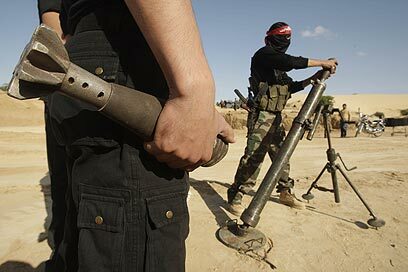 The Popular Resistance Committee (PRC) is a terrorist organization based in Gaza Strip. Formed by former Fatah and Tanzim member Jamal Abu Samhadana in September 2000, the PRC was initially formed as an offshoot of Fatah's military wing, but quickly became in independent terror group. Among PRC ranks are former militant operatives in Hamas, Fatah's al-Aqsa Martyrs' Brigades, the Islamic Jihad and the Popular Front for the Liberation of Palestinian, some of whom are on Israel's most wanted terrorists list. The PRC's military wing, the Salah al-Din Brigades, is responsible for a large number of attacks against Israelis targets, both military and civilian. The Salah al-Din Brigades specialize in planting roadside bombs and over the past few years its militants have become highly involved in rocket fire on Israel's southern communities. Since Hamas took over the Gaza Strip in 2007, and following its repeated reconciliation attempts with the Palestinian leadership in Ramallah, the PRC has been able to gain a stronger foothold in the Strip. By 2011 is has positioned itself as the third-strongest terror group in the Strip, after Hamas and the Islamic Jihad. The PRC has made repeated attempts to gain a foothold in the West Bank as well, but has so far failed to create a true powerbase in the area. The Popular Resistance Committee does not recognize Israel's right to exist and while it publicly supports the PLO's position on Israel, it has voiced fierce objections to the Israeli-Palestinian peace process. Israel believed the Popular Resistance Committee receives most of its funding from Hezbollah.